Thank you for all you do! 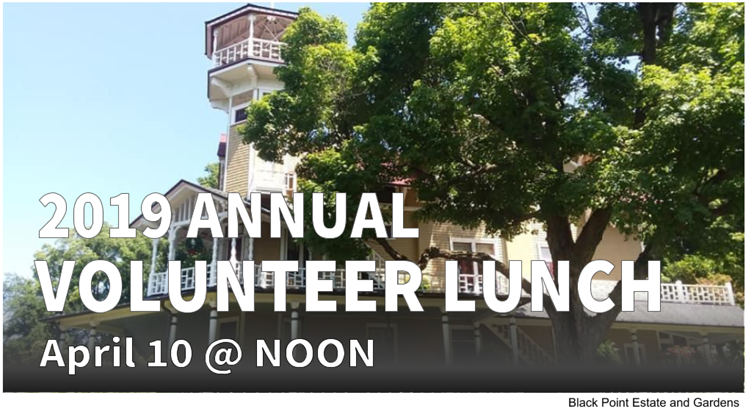 As our thank you for all they do, the BHS invites its dedicated volunteers to join us for our annual Volunteer Lunch. This year, David Desimone, Site Coordinator for Black Point Estate and Gardens, will share its restoration story and why historic preservation can be an asset to any community. Chicago beer baron Conrad Seipp began construction of this summer home for his family in 1887. The magnificent hilltop home on the lake shore is open for tours May through October. Learn what summer life was like on Lake Geneva in the 19th century. You are invited to Beloit Historical Society’s Annual Meeting Dinner and Program. Program on the Industrial History of Beloit will be presented by Dr. Beatrice McKenzie, Associate Professor and Chair of the Beloit College History Department. Guests have a choice of three meals: Wine Country Chicken, Glazed Pork Chop, and Broccoli Alfredo. Each meal is served with salad and sides. Beverages will be included, however no alcoholic beverages will be served. Dinner will start immediately following the conclusion of the meeting. Business meeting is free of charge. Reserve by April 29, 2019. Speaker Michael E Stevens is Wisconsin State Historical Emeritus. He has published fifteen books and more than thirty articles on various historical subjects. A Milwaukee native now living in Fitchburg, Stevens earned his PhD in American history from the University of Wisconsin-Madison.